heart disease and other chronic diseases facing Americans. as smoking a cigarette (and maybe even worse) it is not an exaggeration." What’s wrong with Coca Cola? 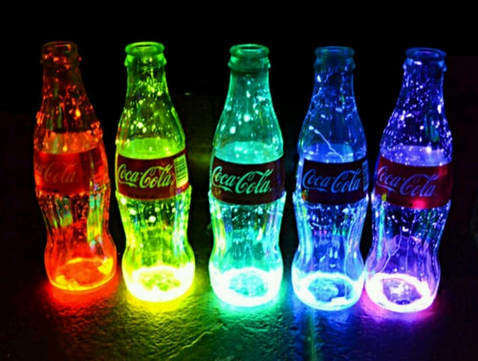 Coca Cola is one of the world's most powerful and profitable corporations. In 2004, the company 'earned' over $4bn in profits; Yet, despite repeated requests, it has not found the time or resources to insure the most basic safety of the: workers who bottle its products or the children who harvest the sugar. They don't even admit their part in the massive environmental devastation in the communities where it does business. 10 teaspoons of sugar hit your system. (100% of your recommended daily intake.) You don’t immediately vomit from the overwhelming sweetness because phosphoric acid cuts the flavor allowing you to keep it down. Caffeine absorption is complete. Your pupils dialate, your blood pressure rises, as a response your livers dumps more sugar into your bloodstream. The adenosine receptors in your brain are now blocked preventing drowsiness. ​Your body ups your dopamine production stimulating the pleasure centers of your brain. This effect of coca cola is physically the same way heroin works, by the way. 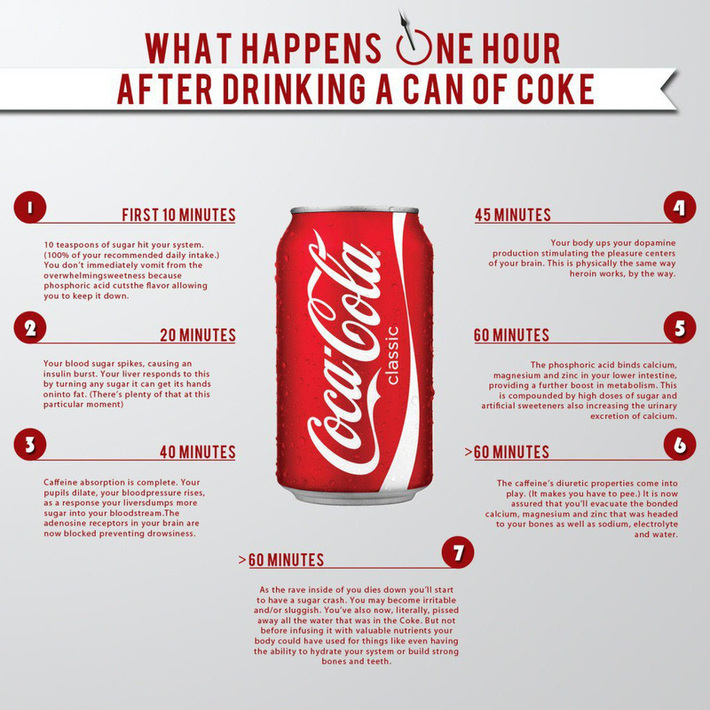 ​The effect of coca cola caffeine diuretic properties come into play. (It makes you have to pee.) It is now assured that you’ll evacuate the bonded calcium, magnesium and zinc that was headed to your bones as well as sodium, electrolyte and water. As the rave inside of you dies down you’ll start to have a sugar crash. You may become irritable and/or sluggish. You’ve also now, literally, pissed away all the water that was in the Coke. But not before infusing it with valuable nutrients your body could have used for things like even having the ability to hydrate your system or build strong bones and teeth. (As little as two if you’re a smoker.) But, hey, have another Coke, it’ll make you feel better. 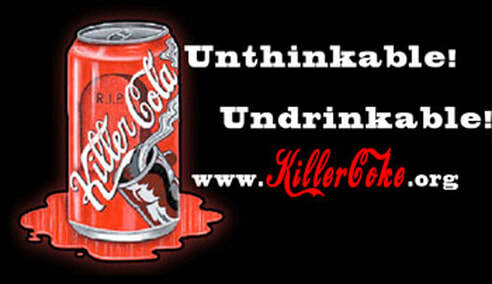 ​but it is the fact that Coca Cola is the Deadly Poison! Go to Her Store – Click Here! 1) Sugar-sweetened drinks can cause pancreatic cancer. 2) Soft drink consumption may lead to hyperactivity and other mental problems. heart disease and other aspects of the metabolic syndrome. 4) Cola consumption has been linked to osteoporosis in women. 5) Soft drinks have been linked to liver disease. 6) Many types of soft drinks have been linked to headaches. 7) Many types of soft drinks have been linked to asthma. 8) Energy drinks with similar ingredients to soft drinks may cause epilepsy. 9) Soft drinks can cause development of kidney stones. 10) Soft drinks can lead to low potassium levels (Hypokalema). The soda industry engages in many of the same marketing tactics as Big Tobacco, including forming “independent” front groups, funding research to discredit links to health problems, and making large donations to health organizations. Soda is linked to numerous health problems among children and adults, including obesity, liver disease and even violent behavior; frequent soft drink consumption is associated with a 9-15% increase in aggressive behavior, according to new research. Processed foods and junk foods are heavily marketed to kids and promoted to schools; manufacturers of sugar-laden processed foods pay “rebates” (aka “kickbacks”) to food service companies that serve school districts across the United States. You can fight back against soda and junk-food giants by purchasing healthy, locally grown organic foods instead of processed foods and beverages. Soda, which is loaded with sugar primarily in the form of high fructose corn syrup, is a leading contributor to the rising rates of obesity, diabetes, heart disease and other chronic diseases facing Americans. ​So when I say that drinking a can of soda is just as bad for you as smoking a cigarette (and maybe even worse) it is not an exaggeration.